WASHINGTON – The Interior Department’s purchase of a plot of private land will allow public access to 32,600 acres of previously isolated forest land, a move that drew praise from wilderness advocates and hunters alike this week. The deal announced Wednesday opens up two parcels of public land, one in the Coronado National Forest and one northwest of Safford, that had been inaccessible because they were surrounded by private property. It was pulled off through a collaboration between state, federal and private organizations. Mike Quigley, Arizona Director for the Wilderness Society, said the society is “very much about having people enjoy the public lands” and that the newly accessible parcels in the Santa Teresa Mountains offer “some of the most pristine backcountry experiences” in the nation. 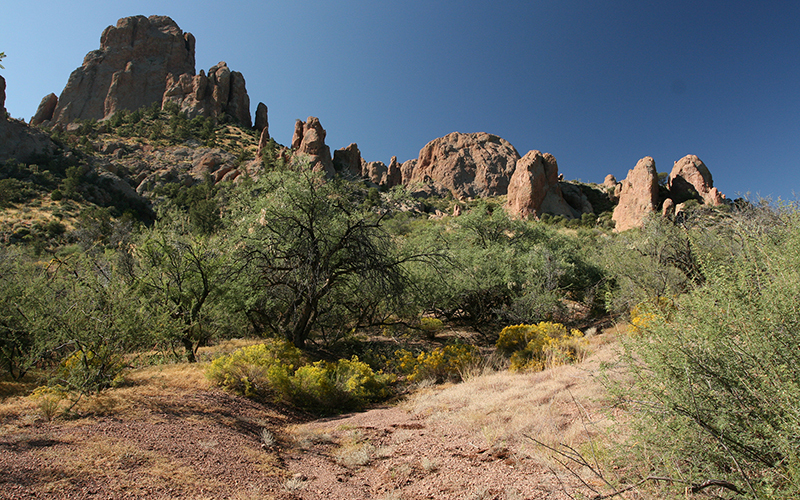 The Bureau of Land Management worked with the Arizona Game and Fish Department, the South Eastern Arizona Sportsmen Club and the Trust for Public Land over several years to acquire the land needed for access. After years of planning by those groups, the deal came together this year when a 600-acre ranch bordering the forest land went up for sale in January, Patrick said. The trust bought the land, and the Sportsmen Club and Arizona Game and Fish spent months getting an easement for “a primitive road across the property and a spot for parking and camping,” Patrick said. BLM then bought the parcel using proceeds from the federal Land Water Conservation Fund. Other funds for the project came from Game and Fish, through its “Landowner Relations Program, and the National Wild Turkey Federation. That easement is currently held by the South Eastern Arizona Sportsman Club,” according to a statement from the Interior Department. “This acquisition will add a new public access point to public lands where it was previously very limited,” Feldhausen said. The Land and Water Conservation Fund, which uses proceeds from oil and gas leases on federal land, is regularly targeted for defunding, most recently by the Trump administration. The announcement comes nearly a month after Interior Secretary Ryan Zinke finished a review of national monuments in which he suggested “downsizing” several, a move that angered wilderness advocates. But Interior officials were quick to note Thursday that the national monument review had “zero impact” on national parks, and the advocates behind this deal said politics was never a consideration. “Bottom line, a lot of people – both blue and red – especially sportsmen, would like to get to their public lands,” Patrick said.